We are racing to stop the immediate and unnecessary slaughter of wild bison in Yellowstone National Park. 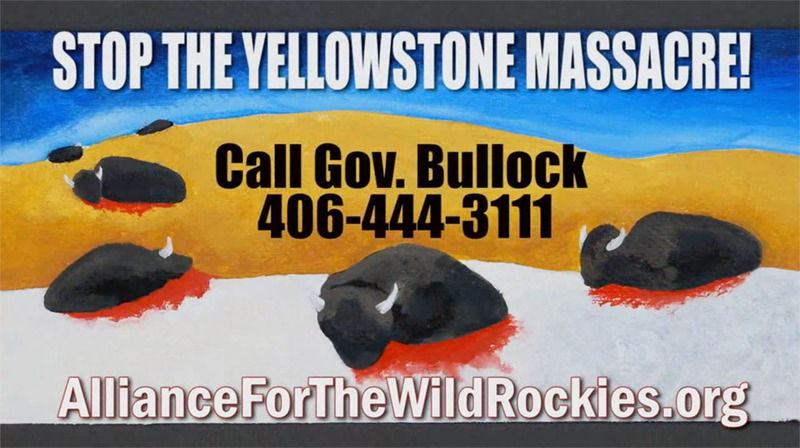 We are putting up billboards and running ads on local television in Montana encouraging people to call Governor Steve Bullock who has the power to fight back against the livestock industry’s misguided lobbying efforts. I need your help to pay for more advertising time so we can reach a critical mass of supporters calling the governor. Ads on Montana television are fairly inexpensive so your money will go a long way. But we have to act quickly. Why is this happening? Bison are migrating out of Yellowstone in search of food on public lands just like they have done for thousands of years. The livestock industry does not want bison to eat the grass that they think should only be reserved for cows so they put political pressure on the State of Montana and Yellowstone Park to slaughter bison. These industry lobbyists are using a bogus argument with no scientific proof to sway the Governor and push their agenda. Governor Bullock has the authority to stop this but he won’t unless he gets enough pressure from citizens. Bison are being rounded up right now and by the end of April it will be too late. Please donate today. Thank you!